According to him, "the resurgence of hate speech is frightening for everyone we see in different countries not just in Africa and but also in Europe. "So, I think that there are many leaders today who want to ensure that we do not ever see a repeat of what happened, the genocide that happened here in Rwanda or any where else in the world for that matter." He said: "the only way is for us to recognize that experience, that is why the President Muhammadu Buhari has emphasized repeatedly that we must contain ourselves, especially in terms of speech that could incite; inciting hate speech and all that. "I think that it is important; that we recognise especially for the people, religious leaders, politicians, it is important that we recognise sometimes that it is easy to push things to the tipping point to create a situation just by inciting words, that we can actually create a situation that can completely go out of control. "I think we have learnt, a lot of us, a lot of African countries do not want to see a repeat of what happened in Rwanda and if you listened to some of the speeches here today, it is very obvious that the wounds for Rwanda were very deep and they are still healing. So, at 25 years on, you can still feel the pain, you can still hear in their speeches, in their voices and in their experiences; this is still a very deep wound." 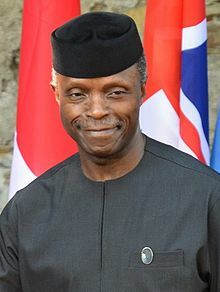 The Vice President prayed that the world never experienced such a thing anywhere, but noted that, "it depends again on leadership and on how our leadership behave themselves." Earlier at the Kigali Genocide Memorial event, Vice President Osinbajo, President Paul Kagame of Rwanda, Former Nigerian President, Chief Olusegun Obasanjo, and other world leaders laid wreaths and performed the lighting of the memorial flame to mark the day. President Kagame had earlier in his remark at the Memorial event, recalled the efforts and courage of Nigeria and other States that made the calls to stop the genocide. According to him, "we owe respect to those who had the courage to do the right thing; our people, other people that also stood up and made a difference - the ambassador from Czech Republic joined colleagues from New Zealand and Nigeria to call for action to stop the genocide despite the indifference of more powerful States." Other world leaders and dignitaries present at the event include the President of Niger, Mahamadou Issoufou; President of Congo, Denis Sassou Nguesso; President of the African Union Commission, Moussa Faki Mahamat; President of the European Union Commission, Jean-Claude Juncker; Former Presidents of Nigeria and South Africa, Chief Olusegun Obasanjo and Thabo Mbeki, amongst many others.